Prime Minister Sheikh Hasina today asked all concerned to take a pragmatic approach to reach the birth centenary celebration of Father of the Nation Bangabandhu Sheikh Mujibur Rahman at the grassroots so that the people can know the true history of the Liberation War. 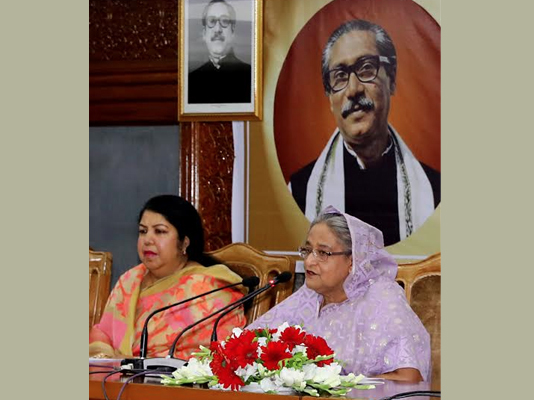 “We will take measures to hold the birth centenary celebration of Father of the Nation Bangabandhu Sheikh Mujibur Rahman at the grassroots so that the people can know the true history of Liberation War,” she said while presiding over a maiden joint meeting for celebration of birth centenary of Bangabandhuat the Prime Minister’s Office (PMO) this morning. that they can get encouragement to engage themselves in welfare of the nation, following Bangabandhu’s ideals, she mentioned. Earlier on February 15, the government formed the 102-member NationalCommittee for the Nationwide Celebration of the Birth Centenary of Bangabandhu. The government also constituted the 61-member Birth Centenary Celebration National Implementation Committee. National Professor Mohammad Rafiqul Islam and PM’s former principal secretary Dr Kamal Abdul Naser Chowdhury have been made president and chief coordinator of the committee respectively. has already reached $1909 and the growth of GDP (Gross Domestic Product) is forecasted to cross 8 percent. country with giving a constitution to run it, she continued. Implementation Committee President National Professor Rafiqul Islam were also present on the dais and spoke on the occasion as members of the committees. Workers Party of Bangladesh President Rashed Khan Menon and JaSoD President Hasanul Haq Inu, gave their opinions as members of the committees.